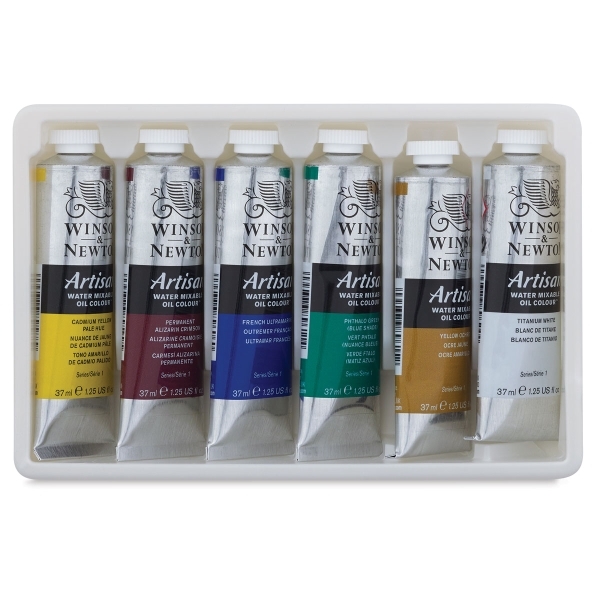 Paint solvent-free with Winsor & Newton Artisan Water Mixable Oil Colors. These economically priced, genuine oil colors are designed to look and work just like traditional oil paint, but they clean up with just soap and water. When Artisan Water Mixable Oil Colors are used with non-hazardous Artisan Mediums, artists can achieve all the traditional oil painting techniques and styles. The paints have a thick, buttery consistency. 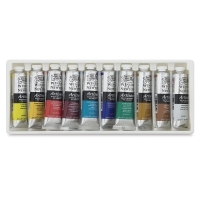 Set of 10 — Featuring a comprehensive range of colors, the Set of 10 includes 1.25 oz (37 ml) tubes of Burnt Umber, Cadmium Red Hue, Cadmium Yellow Hue, Cerulean Blue Hue, French Ultramarine, Lemon Yellow, Permanent Alizarin Crimson, Phthalo Green (Blue Shade), Titanium White, and Yellow Ochre. 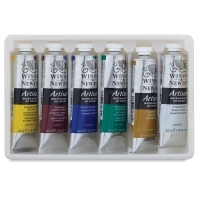 Beginner Set of 6 Colors — Offering a great basic palette, this set includes one 37 ml (1.25 oz) tube each of Cadmium Yellow Pale Hue, French Ultramarine, Permanent Alizarin Crimson, Phthalo Green (Blue Shade), Titanium White, and Yellow Ochre. 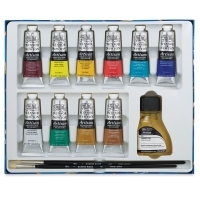 Studio Set of 10 Colors — This boxed set includes 10, 37 ml (1.25 oz) tubes, one 2.5 oz bottle of Artisan Water Mixable Linseed Oil, and two long-handled white bristle brushes. Set colors are Lemon Yellow, Cadmium Yellow Hue, Permanent Alizarin Crimson, Cadmium Red Hue, Cerulean Blue Hue, French Ultramarine, Phthalo Green (Blue Shade), Yellow Ochre, Burnt Umber, and Titanium White. Winsor & Newton Water Mixable Oils contain the same ingredients and perform just like conventional oil colors except that you can use water to clean them up. They are a great choice for artists who have a sensitivty to solvents or who just want the ease of clean-up in the studio or out in the field.